Update - 2017.10.31Unfortunately, BitPeite is a scam and you should not invest in this program, or similar programs like Bitplay.live. BitPetite is now offline and the owners ran away with our money. BitPetite is a trading platform similar to BitConnect, only BitPetite promises a higher interest rate. They advertise that they can guarantee an interest rate of 3.60% or 4.5% daily. Interest rates are fixed every day, and will never be lower than 3.6% on weekdays. During the weekend, this will never fall below 1%. You can start with a small $ 10 investment, which is a lot lower than the $ 100 investment at BitConnect. In this review, we investigate what BitPetite is, whether it’s a legit company and we share our own experience. Share your own experience in the comment section. BitPetite is an investment platform where you can invest your money. They run a Bitcoin tumbler, that’s a service to make Bitcoin transactions secure and private. To deliver this service they charge a fee from their customers and that’s how they generate profits. To run a Bitcoin tumbler effectively you need to have cryptocurrency from a lot of different sources. BitPetite uses your cryptocurrency to fill in the gaps in the Bitcoin tumbler and to generate more new sources. The share the fee they get for their service and that’s the interest rate you’ll get. You invest in the program and make your cryptocurrency available to get mixed by the tumbler. They can promise an 4.5% interest rate for six weeks and an 3.6 interest rate for nine weeks. Compare this percentage with what you get at your bank. That makes BitPetite’s program very interesting to get more money from your assets. The program works on investment and needs investment from new customers to stay in operation. The more people participate in the program the more profitable this program becomes. The website looks very modern and is user-friendly. It’s immediately clear how the website works and how to invest money. The developers BitPetite did their best to deliver a nice website and application for their investors. How to invest money into the BitPetite program? You can choose whether you’re converting your payout to dollars or that you get paid in the chosen crypto. 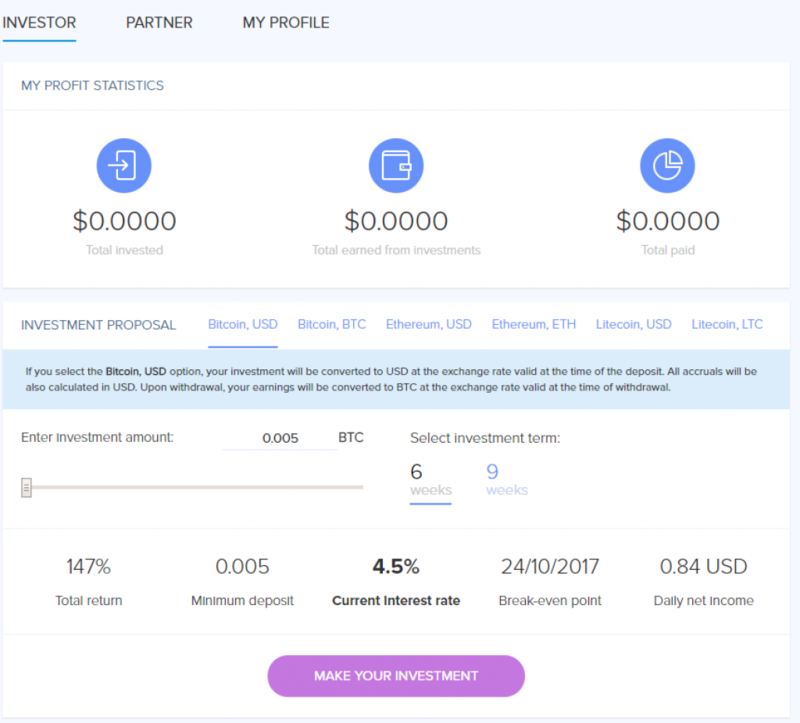 In the image above you can see that we have selected a 0.1 BTC investment. 0.1 BTC is currently approximately $ 375.5. 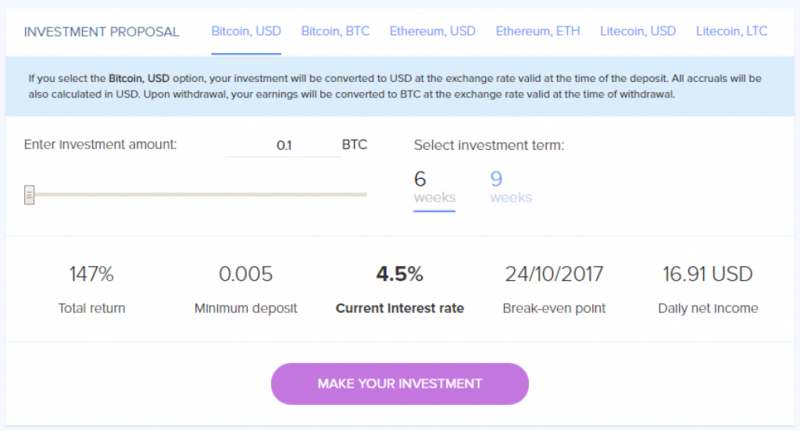 You can choose an investment term of 6 weeks or 9 weeks. The longer your investment, the lower your Current Interest Rate will be. After six or nine weeks, your investment will be released and you can withdraw your investment. You see that you get a total return of 147% in six weeks what makes a total of 0.147 BTC / $ 551,99. The break even point is at October 24th and that’s exactly one month from now. Your daily income will be $ 16.91 and can be withdrawn daily. If you choose to convert it to USD then your profits will be calculated based on the USD / Crypto exchange rate at the time of the deposit. As soon as you withdraw this, it’ll be converted to the crypto based on the current exchange rate of payout. Divident will be paid every hour and you are free to withdraw your profits at any time. Register an account and start start earning a daily 4.6% interest rate! Is Bitpetite a scam or legit? The opinions about this program are widely distributed over the internet. Many people consider it a ponzi or a scam, but others are also very pleased with the program. One thing that is certain is that they exist for a number of months and many people have already made profits. One of the arguments that people argue that this would be a scam is because they have a Bitcoin tumbler service. This is a completely legal service that ensures that Bitcoin transactions are safe and untraceable. It’s a myth that Bitcoin is anonymous because all transactions on the blockchain are insightful. It’s also not true that this service is only used for money laundering, because anyone who gives a little to his privacy should use a Bitcoin Tumbler. The fact that BitPetite successfully manages a cryptocurrency tumbler and has many satisfied customers, is a sign that this is a reliable service. Another reason why BitPetite would be a scam is because when Bitlake went down, you were redirected to BitPetite. Bitlake owners were trying to generate additional revenue by using all the traffic and send them through Bitpetite’s partner program to BitPetite. You can start investing with a small amount and a low budget, and your capital will be released in a short period of time, six to nine weeks. Comparing this with to the BitConnect program the BitPetite program will give you your money back sooner. The website is hosted by eNom, Inc. that gives more confidence than, for example, NameCheap. BitPetite is an investment program where you can make money by securing your investment for 6 or 9 weeks. You receive an interest rate of 4.5% and your divident will be paid every day. Investing in the program can be done with: Bitcoin, Ethereum or Litecoin. BitPetit uses you cryptocurrency to secure their Bitcoin tumbler. You can withdraw your profits at any time. I’m very happy with this program and have had good earnings so far. I now earn 147% in 42 days or 180% in 63 days. F- katharyn kells. There is a picture out there and hope pasted all over.